The machines have just broken into yet another field that was previously the domain of humans – art. Google’s released a tool called AutoDraw that claims to use machine learning to help clumsy humans draw. “Drawing on your phone or computer can be slow and difficult,” says Google’s blogpost announcing the project. AutoDraw helps make it easier by augmenting user-generated drawings with drawings created by professional artists. And the end result is surprisingly effective. AutoDraw lets users scribble drawings quickly on a plain white interface, and once a shape is complete, throws up suggestions on how to improve it. 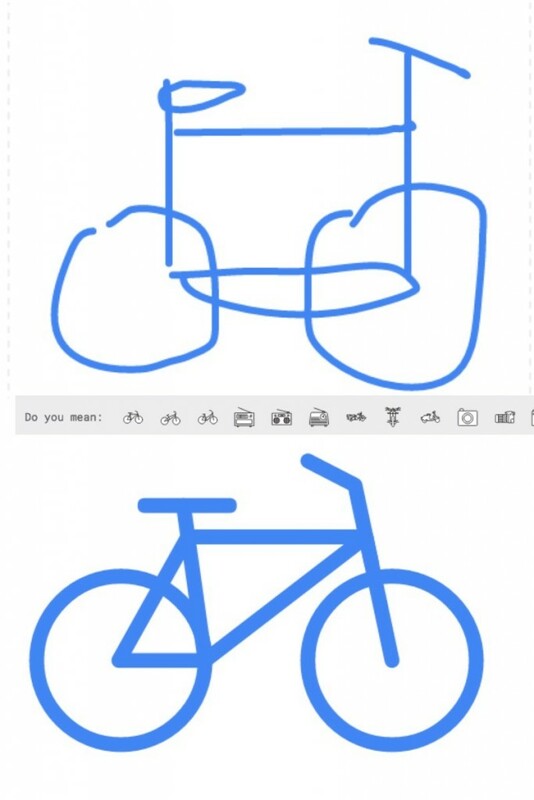 So for instance, a hastily-scribbled two circles and two lines are identified as a bicycle, and simply clicking on the suggestions instantly changes your drawing into a professional-looking bicycle. This is pretty powerful – Google AutoDraw can let users create professional-looking drawings nearly instantaneously. Drawing a cycle is much faster than scrolling through long lists of icons, and gives results that look similar and are similarly orientated to what you’re looking for. And the editor has some helpful, if basic functions. AutoDraw lets users pick colours, draw shapes, and add text. AutoDraw is basically the modern version of the classic MS Paint, with a helpful computer in the background. Google says it’s useful for making posters, doodling in meetings, and even playing Tic Tac Toe. AutoDraw appears to be part consumer product, part machine learning project – Google has been focussing heavily on Machine Learning over the recent years, and has been using it across products, most prominently in Google Assistant. Google also uses Machine Learning to identify pictures in Google Photos, and now it’s taking it a step further – by helping users create drawings of their own. And while the suggested drawings aren’t exactly created by machines – the Google page lists the illustrators and the agencies which presumably painstakingly drew them all – it’s still a pretty cool demonstration of machine learning capabilities. The suggestions are thrown up instantly, and impressively accurate. And while little icons aren’t going to instantly change the world, they’re yet another step towards machines becoming smarter and more powerful than humans ever were.